LOL! Thanks - at one point I kind of lost track of mama bear and next thing I know she is about 20 feet away from me. I slowly backed away but she never paid much attention to me. I use a Canon G9 point and shoot which takes great pictures as the one I posted above & a Canon T2i/550D, that I just purchased used along with three lenses, 50mm, 18-55mm & 75-300mm, carry bag, two 8 gig SD cards, nice tripod, misc. filters for $500. Not a great deal but not a bad one either. Squirrel sitting on top of the alien-looking flower spike belonging to the Chilean Rhubarb. Closing-up on the spike and the tiny red fruits. San Francisco Botanical Garden, Canon Powershot SX50HS. I am kinda looking at that new Canon 70D or the older 7D. wondering if it is overkill. When I quit work the first time in 2002 I had a D30 or 60 can't remember, sold it and all my lenses before we went Cruising the Caribbean, and purchased a Canon PowerShot. The salt water ruined it after 2 years but it did the job. I have since got another Canon A720 point and shoot that gets me by for/till now. So as per my previous post I am interested what would be a good choice for me now. Would only have half the amount of lenses this time though. Now I have been FIREd for the second time and been off for 9 months and not likely to go back, I am thinking I should take up the hobby again. Maybe even take classes this time. It's been a while... At one time I was into amateur photography, but have gotten away... This will be an interesting thread. Prior to retirement, I had my own business in computerized signs. This involved some photography, as well as using software to adjust and improve the visuals. So now, I wonder what types of programs photographers use to enhance pictures. I used Corel 3 and then Corel 10, but frankly it was a bit over my head, as I recall trying to understand and deal with things like layers and vector graphics. In fact, before the advances in computerized programs, the only way to create vinyl/computer signage was to manually digitize forms, shapes, logos etc... an art in itself. So, out of curiosity... do you (anyone) use Graphic editors? If so, which ones?In my dotage, have decided that Irfanview is more than enough for me to deal with, in the kind of pics that I take today. Globe, and finally resulted in multimillion dollar savings in printing costs, as well as (sadly) putting professional etching artists out of business. It was fascinating to see a computer break down pixels for editing, long before I knew what a pixel was. Adobe Lightroom is enough for about 99% of my editing. Once in a while I need to do something more complicated or use a plugin so I also have Photoshop Elements. Hummers from two weeks ago outside of Estes Park, Co. Area is a mess now with all of the flooding. How did you get your guys to pose? Nice Pics. The original guys are very territorial and do more fighting than eating/sipping. Saw this guy taking a drink from a fountain this afternoon. I had the camera in autofocus and it had a hard time focusing on this fidgety little bird. Canon SX50HS, f/6.5, 1/1600s, ISO320, 1200mm lens. Yerba Buena Gardens, San Francisco. Wife shot these as jpg's, so no exposure data. I did HDR on the one at the feeder. Discussing gear is a whole another hobby in itself. I was thinking the same thing - I'd want at least an 800mm. It started when DW and I took a 4-week adult ed class in using Photoshop Elements and I was astonished at what it could do. Later on I bought Lightroom and that was another revelation and I use that for 90% of my images. But I enjoy the full version of Photoshop and the extra precision that allows. There is, ahem, a learning curve with PS though. Software with over 500 menu commands and an apparently infinite number of adjustments is going to have that. Buying a book for both is highly recommended. But it's neat to be able to make composite images like this one, or the sunset one in which I bracketed exposures and used the lower quarter of one exposed for the landscape and dimmed that down so just a bit of the texture and color of the trees showed through instead of just being silhouetted. Or in family photos I'll retouch out blemishes and bruises - no one has yet noticed, or if they did they didn't say anything. Another national park, another bear. 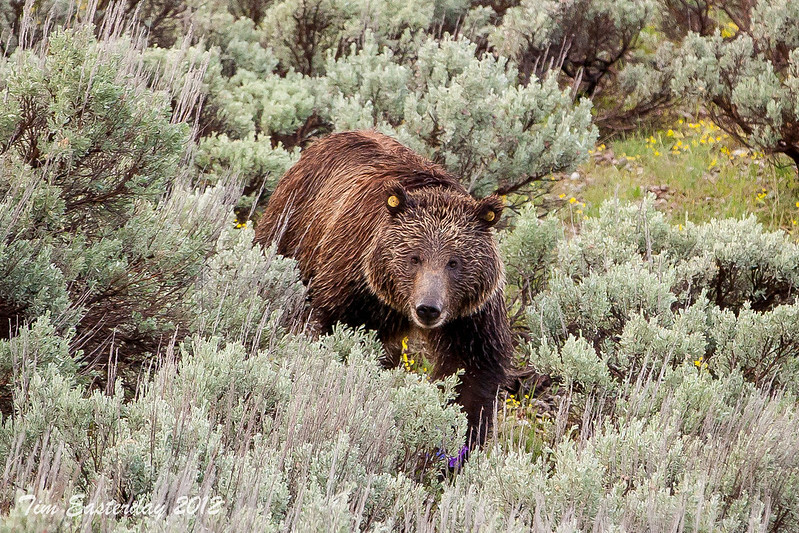 This was taken last year in Grand Teton NP. 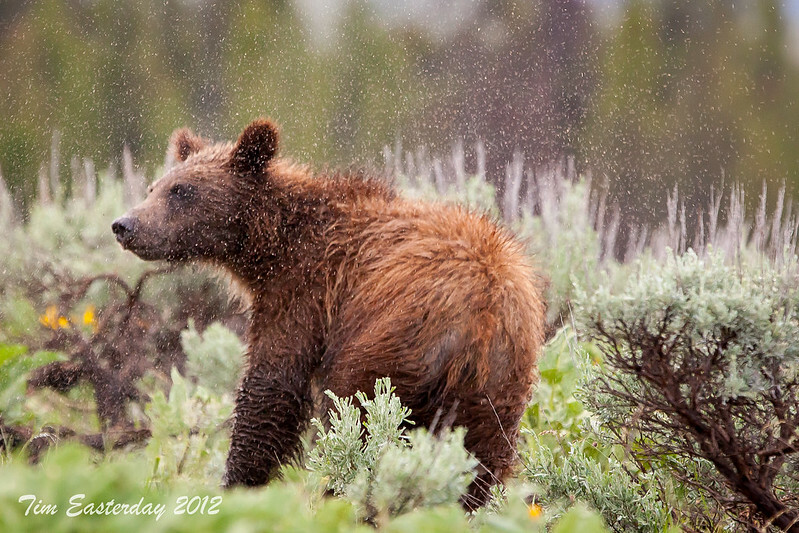 Our first morning there after a rainy night we found grizzly mom #610 and her 3 cubs digging around right next to the road. It was such an amazing experience. We were the only people out there so early in the AM and sat in our SUV watching these bears for over an hour. We couldn't believe our luck on our first full day in our first national park visit. One more. The bears moved off a ways into the sagebrush so we were out of the car taking photos. Then mama bear starting coming back towards the road. This was about the time we decided we had better get back into the car. 1200mm and it barely is big enough. Bird photography isn't for wimps is it?!?!?! Get your farm fresh unpasteurized milk! Bring your own bottle or buy one from the machine. Ljubljana, Slovenia. It's already challenging enough to shoot with a 1200mm lens, but when the target is small and fast moving, well, all bets are off.